Show off your DAC spirit by wearing all the purple and gold you have! Look as silly as you can! Come dressed up as your favorite princess or come as your own princess. A fun and exciting chance for your little one to dance on stage! Exciting opportunity for your little dancer to get a chance to perform on stage! Tryouts are right around the corner. Time to brush up on those skills before they set the Varsity team. Wear your Halloween costumes AND bring your best friend to dance with you! Come and watch your favorite DAC dancers on the Scarecrow Fest Lincoln Park stage! Dedicated time to perfect your turning skills! Call or Email to reserve your spot. 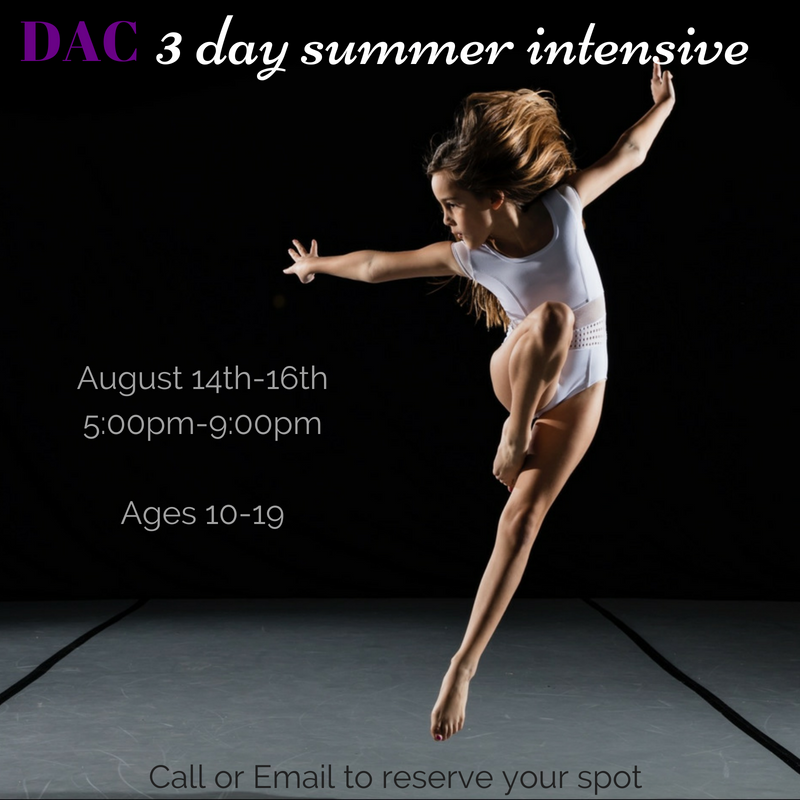 Final auditions for the 2018/2019 DAC Tenacity Dance Company and Performing Troupe. Tenacity Dance Company (TDC) is a competitive pre-professional group based in St. Charles, IL. Competitive dancers will hone their skills and train to compete on a regional and national level. Through motivation and training with TDC, dancers develop in a positive and constructive environment that fosters team work and perseverance. Teaching dancers the importance of commitment will help them achieve their competitive goals and professional opportunities. Tenacity Dance Company believes that hard work and continued drive for excellence enables dancers to flourish. Try some free classes! Free give aways and more!! Oh La La Aloha Dance Camp! Tenacity Dance Company at DAC is an award winning, pre-professional group located in St. Charles, IL. Join us for our 2018-2019 season to train with some of the areas most talented and dedicated young artists. Call (331) 901-5983 or email danceartscenterofstc@gmail.com for more information. Dance Arts Center of STC 2nd annual recital “Dance All Night Recital 2018” presented by Tenacity Dance Company and Tenacity Performing Troupe. See their award winning dancers and choreography live in downtown St. Charles. Tickets available online only for $12 each. TDC & Troupe Performing at STC Live! Tenacity Dance Company and Performing Troupe will be performing their 2018 routines from 5-6pm! See you there!